Cunard Line’s Queen Elizabeth 2. The line is offering North American military personnel $250 in onboard credit. Cunard Line is offering a new benefit for those who serve in the armed forces in North America. The new program grants On Board Credits of up to $250 per person to members of the United States Army, Navy, Air Force, Marines, Coast Guard, National Guard or Reserves, and the Canadian National Defense. Military personnel who are active, retired or disabled veterans are eligible with proper documentation. The credits apply to all published voyages aboard Cunard’s Queen Mary 2, Queen Victoria and Queen Elizabeth and are combinable with other On Board Credit offers. The amount of each credit varies with cruise length: $50 per person for a cruise of six days or less; $100 per person for cruises of seven to 14 days; or $250 per person for those 14 days or longer. Under the terms of the program, retired status applies to enlisted personnel or officers with a minimum of 20 years of service, medical retirees and the 100 percent disabled. Veterans with an honorable discharge and a length of service that meets certain minimums also are eligible to apply. Military status must be confirmed prior to embarking on the voyage to be eligible for credits. Cunard has a distinguished history with the military. During World War II, the Queen Mary served as a British Royal Mail Ship and, along with the original Queen Elizabeth, as a troopship. In addition, Winston Churchill credited Cunard with ending the war one year early because of the troop transfer services that both ships provided. 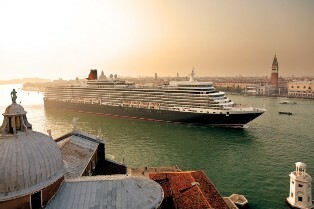 For more information about Queen Mary 2, Queen Victoria and Queen Elizabeth or to book a voyage, consult your Travel Agent, call Cunard toll-free 1-800-728-6273 or visit http://www.cunard.com.